Place your holiday orders by November 30th! As I mentioned on The Amp Hour, I’ll be traveling abroad for most of December. If you’d like to order a Geiger Counter or HV Rescue Shield, make sure to place your order by next Thursday, November 30th. I’ll update the shipping status page to reflect this. 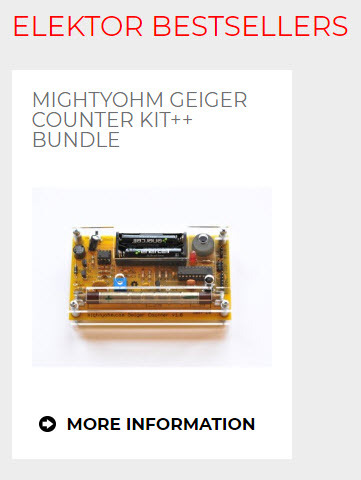 If you are interested in purchasing a Geiger counter kit and miss the deadline, no worries! You can also purchase one from Adafruit. My Geiger Counter kit is now for sale at Tindie. You can also check out my Tindie store. Starting today I am now offering two shipping options for international customers – expedited and economy shipping. As some folks are no doubt already aware, USPS Priority Mail International costs have more than doubled in the past few years. Back in 2009 it cost about $12.95 to ship a USPS small flat rate box overseas. As of this year, the cost to ship that same small flat rate box is now over $30! I’ve received feedback from several customers that the costs to ship overseas were too high, so I started looking at other options and found that USPS First-Class Package International offers slower delivery times (4-6 weeks) but costs less than half as much as USPS Priority Mail. In fact, the current USPS First-Class Package International rates are pretty close to what I was paying for Priority Mail when I first started selling kits. With this new economy shipping option, I can ship a single kit to Canada for $9.50 and to most of the rest of the world for $13.50. I hope that the economy option appeals to overseas customers who are willing to wait a bit longer to receive their kit. For folks who are more impatient, I am still offering Expedited shipping (via USPS Priority Mail). For super time-critical orders I can also offer Express shipping on a case by case basis (please contact me before placing your order). Important note: Regardless of shipping method, VAT taxes, duties, import tariffs, customs fees, etc. are always the responsibility of the buyer. Micro Center is selling off their remaining stock of Geiger Counter kits at a substantial discount. Looks like there are still a few in stock at select locations.